This is the order from left to right as they stand on the stage (from the audience's point of view). Fernando Abrantes performed during the 1991 tour, to be replaced later by Henning Schmitz. 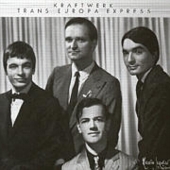 From the concerts in 2008, Florian Schneider, one of the founders of Kraftwerk, finished the touring with Kraftwerk (and left the band...) and replaced by Stefan Pfaffe who was a member of the KlingKlang crew (his name is mentioned on the inner slave of the live album Minimum-Maximum). From the year 2013, Falk Grieffenhagen followed Stefan Pfaffe on the stage, he is a sound and video engineer, visual media creator and software developer. "NZH: - Who is coming as Kraftwerk to New Zealand, because I see Florian hadn't played with Kraftwerk in Ireland recently. Ralf Hütter: - Yes, he never likes touring so in the last years he is working on other projects, technical things. So we are travelling with our live set-up as on the last American tour and now Europe. We are me, Mr Henning Schmitz, Mr Fritz Hilpert and Mr Stefan Pfaffe who is programming visuals with us." "RS: - Is Florian consulting at all with the new project? Ralf Hütter: - No no, he's not been with us for the last decade. He's concentrating on research on speech synthesis and things like that. He's not been involved with the music for a very long time." For the latest information and rumours, please visit any sites mentioned at the links page and / or join a mailing list and / or a forum. It appears that Wolfgang Flür and Karl Bartos were frustrated by the slow pace of work within Kraftwerk and by the reduction of their role in the group's activities (see Pascal Bussy's book Kraftwerk: Man, Machine and Music). In an interview with Aktivität magazine, Flür stated that "I left this band because I had the feeling to do something else after all these years. It was a very hard break for me, with lots of depressions following, but I knew 'something had to be changed' ". He has since written a book about his time with Kraftwerk. Karl Bartos subsequently worked with Lothar Manteuffel as "Elektric Music", but now records solo under the slightly different name "Electric Music". He has also contributed to releases by other artists, including Orchestral Manoeuvres in the Dark, The Mobile Homes and Electronic. His latest activities are covered by his official web site. Wolfgang Flür's activities were initially the subject of some confusion and rumours: it is sometimes claimed (incorrectly) that he wrote the soundtrack for Robocop 2 and there was even a widespread rumour that he had died! In reality, upon leaving Kraftwerk not long after the release of Electric Cafe (around 1986/87) he returned to working as a designer of furniture. In 1993 he brought out a privately issued cassette single under the name "Jamo" (not "Yamo"): entitled Little Child, it featured lyrics and cover design by long-time Kraftwerk collaborator Emil Schult. In addition to working with bands such as Mouse on Mars (1995's album Iaora Tahiti) and Excelsior (their debut release) he has developed his solo career under the name Yamo and written a book about his time with Kraftwerk. You can get some info at www.musiksoldat.de and see his facebook profil. Emil Schult is an artist who started to collaborate with Kraftwerk as early as 1972. He finished his education at the Kunstakademie in Düsseldorf in 1973. He provided lyrics and graphic design for kraftwerk. For example the cover of Ralf & Florian, Autobahn, Radioactivity, Computerworld, and projections of his artwork are still used in their concerts. In 1982 they went separate ways. Schult has also worked with former Kraftwerk member Wolfgang Flür. It looks like Schult and Kraftwerk have started to work together again. The band apparently does not actively encourage correspondence. There is no official fan club, and no way of making contact has been announced. You might be able to make contact through organisations with which they have had dealings (record labels, venues etc.) but unless you are already known to the band success seems unlikely. If an official contact address is ever made available, no doubt the official Kraftwerk homepage (www.kraftwerk.com) will announce it. Not as much as we would like, mostly the work related matters known from interviews, press conferences and books. Of course the fans want to know as much information about them as it can be possible but they do not like publicity. Please, respect their private life! See also the page of 'Sources of further information'. The members of Kraftwerk are not known to have adopted any party political stance. Many of Kraftwerk's songs show an interest in the ramifications of technology, but issues are normally dealt with in an ambivalent fashion. The one notable exception to this has been the new version of Radioactivity and Kraftwerk's subsequent appearance at a benefit opposing the Sellafield nuclear reprocessing plant. 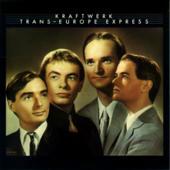 It has been suggested occasionally that Kraftwerk's concentration on machines reflects Nazi or otherwise fascist views. There is no evidence to support such speculation. Regrettably this has not stopped some of the less intelligent journalists over the years from concluding that an interest in technology coupled with being German equates to Nazism! The front cover design for The Man-Machine has caused some to comment on fascist imagery, but given that the uniforms are red and the title repeated in Russian, any reference is clearly to Soviet imagery (the Russian Constructivist artist El Lissitsky is an acknowledged influence on the design of the album sleeve). This issue is covered in Pascal Bussy's book Kraftwerk: Man, Machine and Music. In his autobiography, Wolfgang Flür writes of the "dreadful mass stupidity and repulsive military fanticism of a generation submissive to orders". The correct spellings are: Ralf Hütter and Wolfgang Flür, with an umlaut over the "u". However, the German character 'ü' is not represented in the ASCII text system used by most email systems. The standard German way of representing the ü character when it is not available is to write 'ue', so you may often see the spellings Huetter and Fluer. Not everyone is aware of this convention, so you may also see the names spelt with the umlaut removed, i.e. Hutter and Flur.